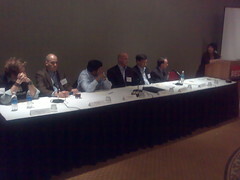 Most of the panelists do a mixture of traditional Open Source model (software + services) and Software as a Service (SaaS). Seems like this becomes the mainstream business model for Open Source products that are useful for end users/consumers. At Mindquarry, we’ll offer a hosted solution of our Open Source product as well. Ranga Rangachari (Groundwork Open Source) sees a general move away from the typical use of self-hosted Open Source software within enterprises towards SaaS. Bill Soward (Adaptive Planning) described that there’s a successful path for lead generation from those who download and try out the freely available Open Source product and then simply buy a subscription for the SaaS offering to use it in production. Bob Walters (Untangle) made a highly interesting general comment on the “marriage of Open Source and SaaS”: The central issue here is that e.g. a (the?) major SaaS provider, Google, made several great improvements to the Linux kernel but does not give them back to the community. Here, SaaS works against the community spirit of Open Source. GPL v3 is supposed to help avoid this issue. Bob Walters made a good point in saying if you miss attracting a developers community, you miss 75% of your business. Dells recent announcement to ship their computers packaged with Ubuntu lead to the question of Linux on the desktop. Michael Sikorsky (Cambrian House Inc.) stated that Linux will definitely win the mobile market, even if it won’t make it on the desktop. Mike Guiterman (SourceFire, the company behind Snort) made a general comment on what the diversity of available Linux distributions means to his Open Source company: They make sure that their product supports the main distributions and have the community provide solutions and services for all other. I think that for all kinds of companies (IT or not) Open Source communities/software/etc. is going to be a valuable asset in remaining competitive. Regardless of what license Open Source projects leverage, and regardless of what commercialization/monetization models companies leverage… I believe that the commercial organizations at the very least be _proactively_ giving _something_ back. Even if it is just filing bug reports, or promoting a project. Without that, everyone loses, and the OS community would be getting advantage of by commercial interests… something I hope never happens. That being said, I hope to see more companies like Untangle which rely heavily on open source, and also contribure heavily back. Thats great to see, and I look forward to seeing more companies follow the lead that Untangle has set forth, in that respect. Ian is raising up an important issue here, and among open source firms I believe that being able to contribute back will become more and more important.